You’re always assured a warm welcome at the Black Horse Inn…a truly British country pub in the beautiful hamlet of Nuthurst. 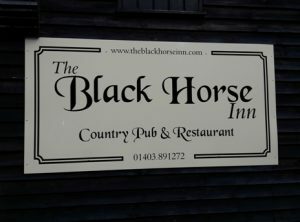 With low beams and open fires, home cooked food, and a huge choice of cask ales and wines, The Black Horse is a firm favorite with customers who appreciate the friendly service and unique charm and atmosphere. We’re proud of our growing reputation as a country pub where everyone’s welcome. From regular customers and diners to dog walkers, ramblers and families with young children…there’s something for everyone at the Black Horse.